The Last Days is the time in which we now live. The days (or dispensation of time) just before the Second Coming of the Lord. See the article called Signs of the Times. The "Last Dispensation of the Fulness of Times" began when the gospel of Jesus Christ was restored by the Lord through the Prophet Joseph Smith, the first prophet of the dispensation. This dispensation will eventually see the restoration of all aspects, powers, authority, and ordinances of the fulness of the gospel, the Second Coming of the Savior, and the revealing of hidden truths. At the culmination of this dispensation, the Millennium will be ushered in. The Millennium will be 1,000 years of peace wherein all people will confess that Jesus is the Christ, and wherein the fulness of His gospel will fill the earth. During the Millennium, there will be no evil (for Satan will be bound), and no sickness nor death. Children will grow up in righteousness. And many people shall go and say, Come ye, and let us go up to the mountain of the Lord, to the house of the God of Jacob; and he will teach us of his ways, and we will walk in his paths: for out of Zion shall go forth the law, and the word of the Lord from Jerusalem (Isaiah 2:2,3). Mormons understand that the above verses refer to temples, and that Zion and Jerusalem are two separate places. Zion will be on the American continent as a gathering place for the descendants of Joseph. Its center will be at Independence, Missouri, and there a temple will be erected. It will also be called the "New Jerusalem." Ever learning, and never able to come to the knowledge of the truth (2 Timothy 3:1-7). Certainly, this is an apt description of our time. And saying, Where is the promise of his ccoming? for since the fathers fell asleep, all things continue as they were from the beginning of the creation. Before the flood, Noah and his sons preached repentance for decades, but no one listened, claiming that things were the same as always, moving along as usual, and that there was no need for change or repentance. This same attitude is prevalent in these last days. Every man follows his own desires and believes he can continue that behavior always. Those who have spiritual truth, know that this is not the case. Wickedness is increasing, the signs of the times are coming to pass, and the Second Coming of the Lord is nigh. The following is a prophecy from the Book of Mormon. The "seed of my brethren" are Amerindians, and the "Gentiles" are Europeans and Americans of European descent. The book referred to is the Book of Mormon. But behold, I prophesy unto you concerning the last days; concerning the days when the Lord God shall bring these things forth unto the children of men. After my seed and the seed of my brethren shall have dwindled in unbelief, and shall have been smitten by the Gentiles; yea, after the Lord God shall have camped against them round about, and shall have laid siege against them with a mount, and raised forts against them; and after they shall have been brought down low in the dust, even that they are not, yet the words of the righteous shall be written, and the prayers of the faithful shall be heard, and all those who have dwindled in unbelief shall not be forgotten. For those who shall be destroyed shall speak unto them out of the ground, and their speech shall be low out of the dust, and their voice shall be as one that hath a familiar spirit; for the Lord God will give unto him power, that he may whisper concerning them, even as it were out of the ground; and their speech shall whisper out of the dust. And the Gentiles are lifted up in the pride of their eyes, and have stumbled, because of the greatness of their stumbling block, that they have built up many churches; nevertheless, they put down the power and miracles of God, and preach up unto themselves their own wisdom and their own learning, that they may get gain and grind upon the face of the poor. And there are many churches built up which cause envyings, and strifes, and malice. The following is from the Pearl of Great Price, the Book of Moses. But before that day [of the Lord's coming] he saw great tribulations among the wicked; and he also saw the sea, that it was troubled, and men’s hearts failing them, looking forth with fear for the judgments of the Almighty God, which should come upon the wicked (Moses 7:60-67). 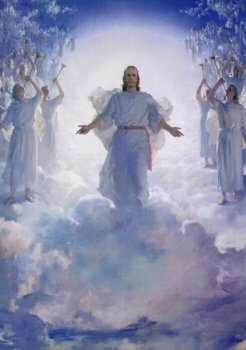 For a list of scriptures referring to the Second Coming, click here. This page was last edited on 14 September 2011, at 08:44.